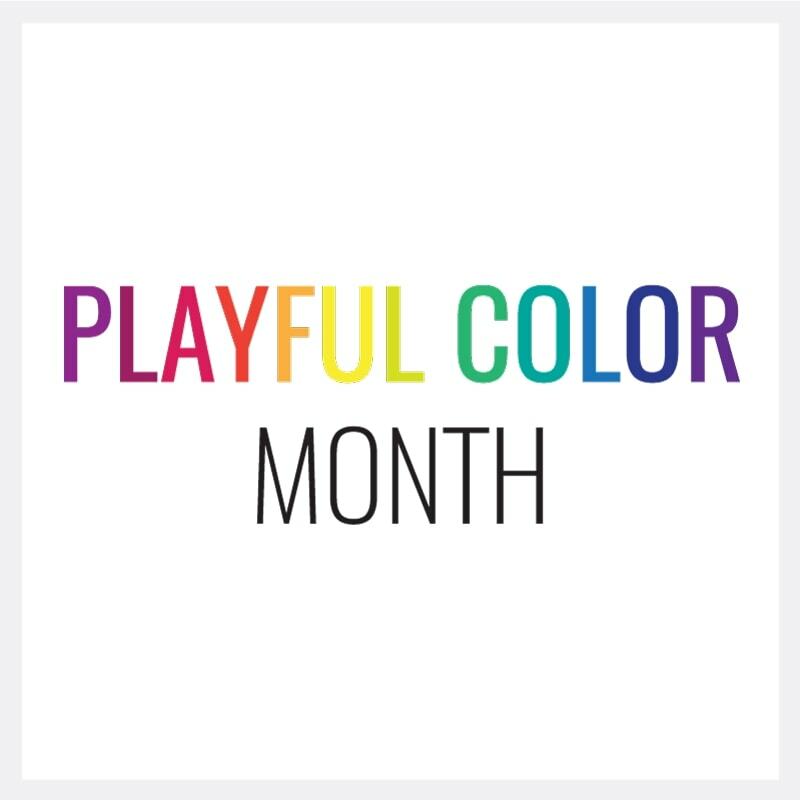 Welcome to back to Week 3 of Playful Color Month. This week we’re learning about one of my favorite color tricks, the Personal Color Wheel exercise. As a quick refresh, during Week 1 we talked about symptoms of color trouble (how do you know when you’re having trouble?) and the causes of color trouble. In Week 2, we started to tackle color trouble by beginning to add tools to our Playful Color Toolbox. Today’s Goal: Tuesday I introduced you to the Personal Color Wheel exercise. Today I want to show you how to use the Personal Color Wheelhouse exercise to choose colors for a real project. To that end, I’ve made my Jacks pattern available as a free pattern to my Newsletter subscribers. In the past, without a personal color wheel, I have struggled with putting together colors quickly. 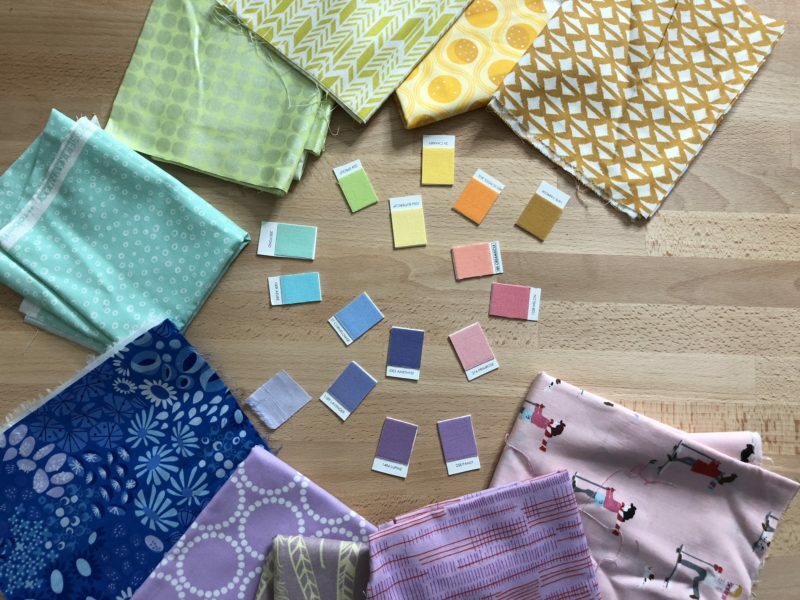 I discovered that having a go to Color Wheel has streamlined the color choosing process and let’s me get to the fun part – the sewing. 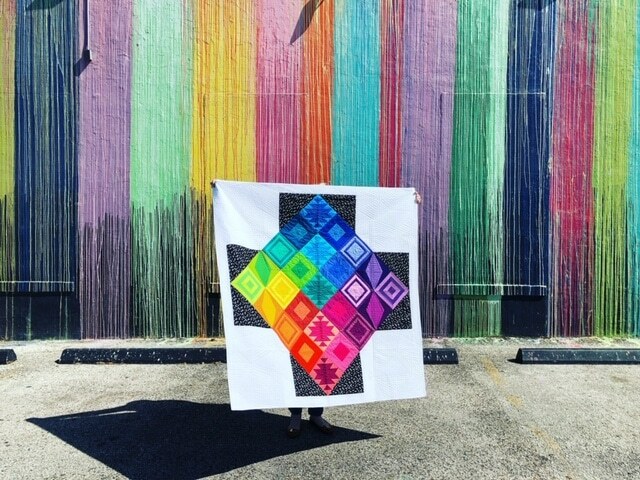 As I mentioned on Tuesday, you can use your Personal Color Wheel to help you generate palettes quickly for new rainbow quilts. And it can help you choose the colors when there are fewer or greater than 12 colors. For example, Rainbow Jacks calls for 16 colors. Once I have my pastel color wheel drafted, I can quickly pull fabrics from my stash and get to sewing. 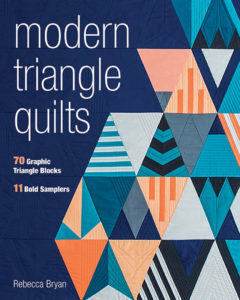 Aren’t those fabrics pretty! And the best part is that choosing the color this way makes it so much quicker and easier. Yah! I’ve struggled in the mires of color for years. As I fought my color battles I learned lots of color tricks. And I am here to share them with you so that you can maximize your creative fun time. And by now I hope you are seeing the potential of my Playful Color Toolbox and are getting excited about playing with color! So far we’ve added three ways to play with color to our Playful Color Toolbox. Yah! 1. 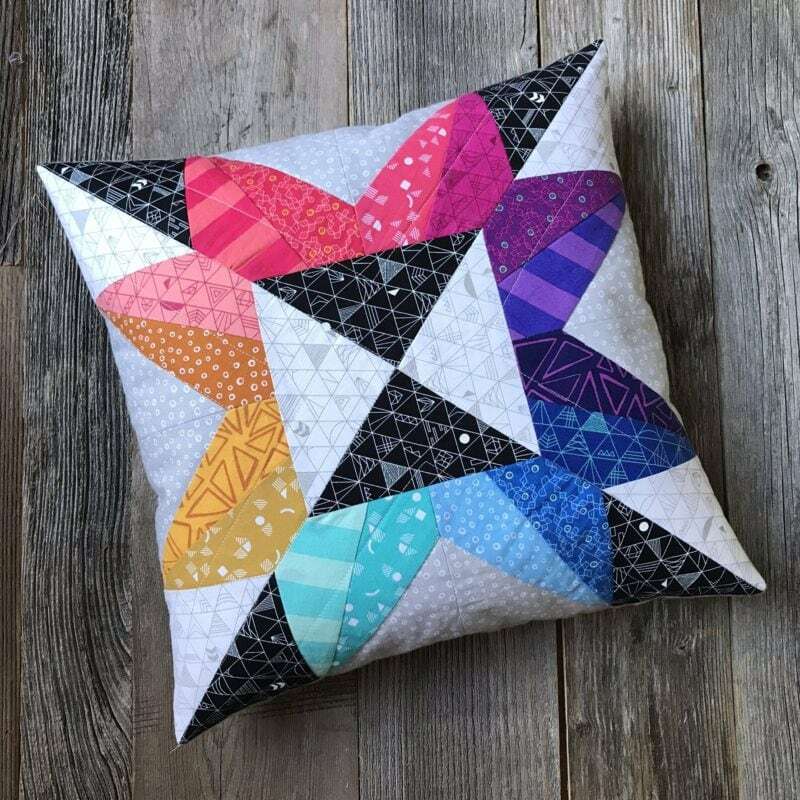 Playful Color Tool: The best way to use big, busy, bold fabrics is to reign in the chaos by organizing your quilt either by pattern or color. 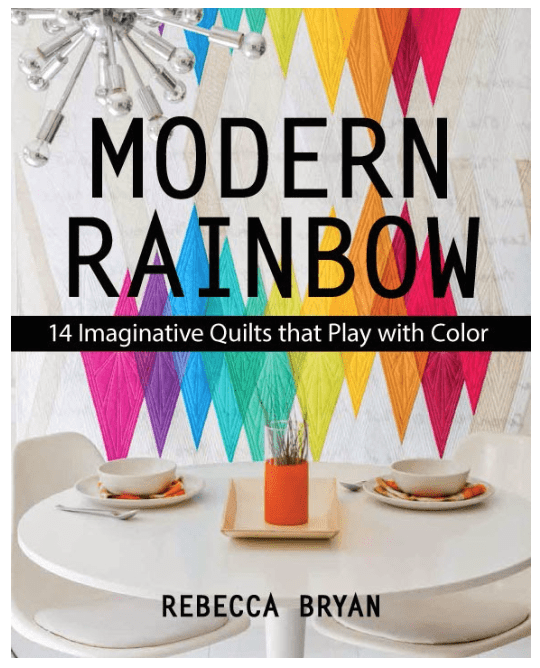 Tomorrow I’ll be hosting a live event where I show you how I pull fabrics using my Personal Color Wheel for the new(ish) free pattern, Rainbow Jacks. You can join in live in my Facebook Group. Next week, I’ll be showing you some of my personal favorite supplies I use to explore color and the Fall Session of Playful Color Theory for Quilters will start. I hope to share more details very soon! If you are loving these Playful Color Tools and you want more, you’ll love my online workshop launching at the end of the month, Playful Color Theory for Quilters. Registration is now open (newsletter friends, wait for the discount code in your inbox before registering!) for the Fall session and will close on September 30th. This workshop is a great resource to learn more about color theory and to add more tools to your Playful Color Toolbox. Specifically you’ll be learning alllll my tools in that workshop, should you choose to enroll. In the meantime, enjoy the video. 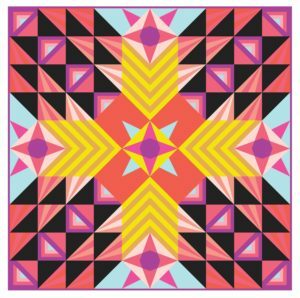 Registration for the Fall Session of Playful Color Theory for Quilters is now open and will close September 30th.